Toronto (April 30, 2015) — NexJ Systems Inc. (TSX: NXJ), a provider of cloud-based software, delivering enterprise solutions for the financial services, insurance, and healthcare industries, today announced financial results for its first quarter ended March 31, 2015. A replay of the call will be available beginning today at 8:00 p.m. ET through 11:59 p.m. on May 7, 2015 and can be accessed by dialing 416-849-0833 (Toronto local) or toll free at 1-855-859-2056 and using password 27588864. 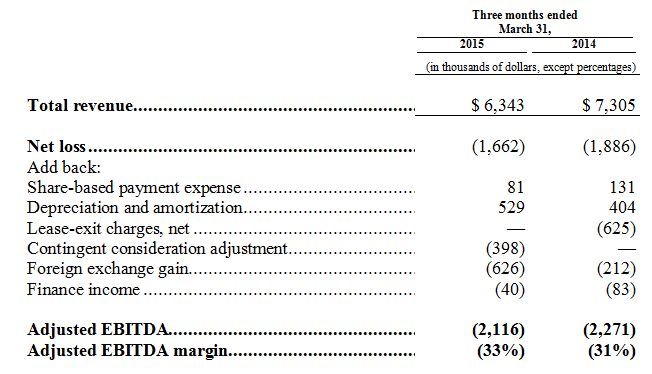 The term “Adjusted EBITDA” refers to net income/loss before adjusting for share-based payment expense, depreciation and amortization, lease-exit charges, net, contingent consideration adjustment, earn-out expense (recovery), foreign exchange gain/loss, finance income, finance costs and income taxes. 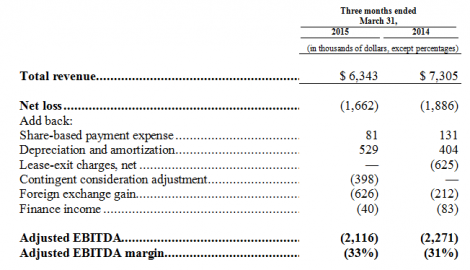 “Adjusted EBITDA margin” refers to the percentage that Adjusted EBITDA for any period represents as a portion of total revenue for that period.